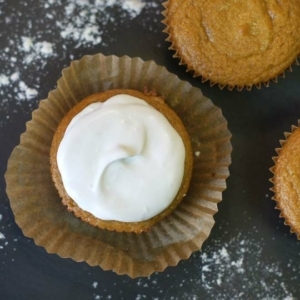 These cupcakes are surprisingly moist and delicious, with a secret hidden ingredient. I love “sneaking” an extra serving of vegetables into decadent-tasting treats, and these cupcakes are no exception–> they get their extra moisture from the addition of zucchini, instead of oil or butter! Don’t worry, no one will be able to tell. The resulting cupcakes are moist and fluffy, with no trace of vegetables! I hope you’ll love working with coconut flour as much as I do. It’s more allergy-friendly than it’s almond flour counterpart, and you only need a very small amount in each recipe. One bag of coconut flour can last quite a long time in your pantry, making it a more economical grain-free choice. Naturally sweetened with pure maple syrup and loaded with protein, these cupcakes will make the perfect sweet treat at your next special event! Preheat your oven to 350F and line a standard muffin tin with parchment liners. To easily whip up the cupcake batter, I like to throw everything into a blender and blend until completely smooth. If you don’t have a blender, you’ll need to puree the zucchini in a mini food chopper, then whisk the ingredients together until well combined. 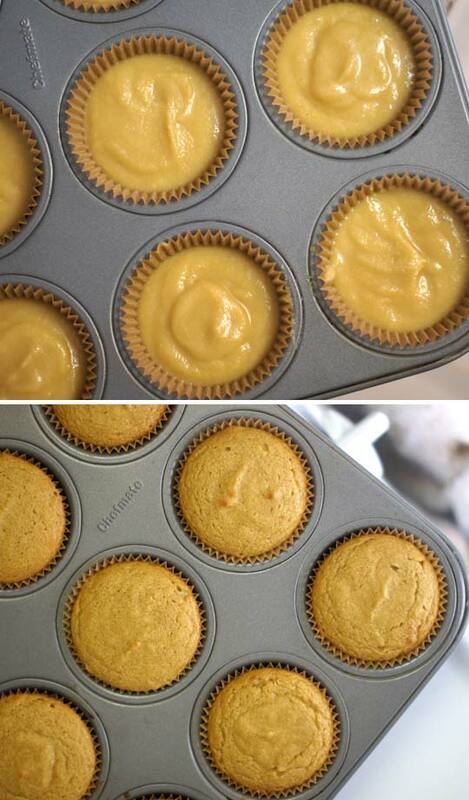 Transfer the batter to the paper liners in the muffin tin, filling each one half-way. Bake at 350F for 20 minutes, turning the pan half-way through the baking time for even results. I frosted mine with some Coconut Whipped Cream, but they’d be delicious with any frosting you like! 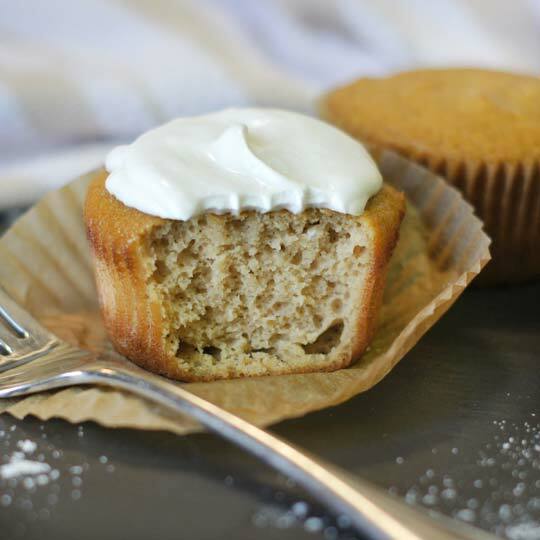 A light and fluffy grain-free cupcake, with a "sneaky" serving of zucchini! To easily whip up the cupcake batter, I like to throw everything into a blender and blend until completely smooth. 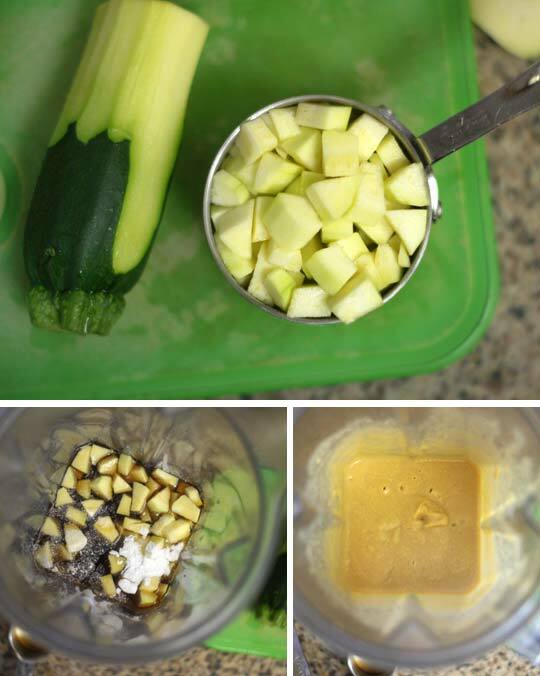 If you don't have a blender, you'll need to puree the zucchini in a mini food chopper, then whisk the ingredients together until well combined. Allow to cool completely before frosting and serving. I frosted mine with some Coconut Whipped Cream, but they'd be delicious with any frosting you like! If you don’t care for maple syrup, feel free to try using honey or coconut nectar instead. (Honey is slightly sweeter in flavor, so I’d use less than the 1/2 cup.) If you want a sugar-free option, you’ll have to really experiment with stevia or xylitol, as it will definitely change the results. Please do NOT substitute any other type of flour for coconut flour. It will not work, and you will waste your ingredients in the process. Reader Feedback: What’s your favorite flavor of cake or cupcake? Mine is carrot cake, so that’s next on my list! Has anyone added cocoa powder and made chocolate zucchini cupcakes? Hello! I love all your recipes, I am very nervous about using coconut flour so I thought I’d ask for your advice! So my question, if I want to make 1 dozen chocolate cupcakes, should I follow the donut recipe and double it, and then bake them for 20 minutes? Do you have any suggestions on a good flavor to substitute the vanilla extract for? I am unfortunately, allergic to vanilla. I will usually just leave it out, but I would love to hear any flavor ideas! My other favorite flavoring is almond extract, so I’d try that! Just made these and they turned out perfect!!! Moist and cakey! I doubles the recipe and used 1/2 cup raw honey and 1/4 cup brown sugar becuz that’s all I had. I also added about 1/2 cup almon milk becuz the batter was too thick and filled the muffin tins 3/4 the way. Fantastic! After frosting them I put slices strawbery hearts for Vday, thanks so much for the incredible recipe!!! Also you cannot taste zucchini AT ALL! have you ever tried this recipe for a full-sized cake? do you think it would hold up? Could I use store bought shredded coconut instead of the coconut flour? Thank you for this recipe! A friend shared it with me and I will forever be grateful! Amazing, moist cake and I topped it with your peanut butter fudge frosting. This is my new late night indulgence! I go to sprouts and by their brand. 16oz will run you about $3.85-$4. The best price I’ve seen and the flour is great! Have made a ton of Meagan’s recipes! hello Megan I tried these cupcakes and they looked and smelled so good in the oven but they became deflated as soon as I pulled them out of the oven. Thank you for this recipe. My daughter has very limited diet options, with this recipe she was able to have a cupcake at her birthday party. These look great! Too funny I use zucchini to replace sugar bulk in recipes I make with stevia! Even I thought I was crazy but it works so well! I can’t wait to make these I have some coconut flour burning a hole in my cupboard! Just made these yesterday. They are fantastic! Can you recommend the best way to store them? Fridge or counter? Thanks so much for your delicious recipes! You make grain free living so much more enjoyable! I baked these this morning. I have fresh strawberries cut up with a little bit of sugar. This will be my strawberry shortcake desert for tonight. I love your blog and make many of your recipes on a regular basis. These turned out too “eggy” though, IMO. I haven’t noticed this in your other grain-free recipes, though. Mine didn’t puff up either -maybe baking powder would work better than baking soda in this recipe. However they taste wonderful and make a delicious base for strawberry shortcake. Simply split the cupcake in half, top with sliced fruit and a dollop of cashew cream. Thank you for all your recipes!!! I made your sweet treats once a week. Is so delicious and its more healthy then what we find at the grocery store! :)Thanks again! Yummy, I have these in the oven right now and the batter is super yummy! I doubled the recipe (I have 3 kids) and used half maple syrup and quarter honey. Nice and sweet! Also made coconut whipped cream frosting and strawberries for the top! Thanks so much for you recipes- So many are now are “regulars”! OMG! These look and sound so good! I seriously cannot wait to try them, and I even have a bag of coconut flour in the pantry waiting to be used. I made these tonight along with a chocolate avocado frosting and they are AMAZING. I can’t believe how good they are, self-control will be tough here! Thanks for such a great recipe! Hi, just made them! I had all the ingredients on hand so I was very excited to give them a try. I like to use rice malt syrup as I don’t eat sugar. I doubled the recipe but was short on syrup so I used 1/2 cup and 1/4cup stevia. I did not get the same purée as you as my mixture seemed a lot fluffier, maybe due to different brand of coconut flour. I added a little coconut milk as my mixture was dryer also, maybe from the stevia powder. Although mine came out more like a muffin than a cup cake, they were still delicious. I love the addition of the zucchini! Great way to get veggies and eat something sweet at the same time. I’ll definitely be trying these! Do you think yellow summer squash could be substituted in for the zucchini in this recipe? Sad to say… I just made this and they didn’t turn out for me. Followed the recipe exactly… 🙁 I had to bake for another 5 minutes since 20 didn’t seem to be enough, and even then they came out super dense. They tasted ok, but I think they would have been a lot better if they came out fluffier like yours seemed to have. Maybe next time! I had the same issue. I only cooked for 20 but they don’t look the same as the picture. I have a high powered blender but it didn’t seem to make the same looking puree. So it tastes a little grainy and a little more dense than it looks in the picture. Next time, I will try in my food processor instead. What brand of coconut flour did you use? I wonder if that makes a difference… And are you using large eggs? Smaller eggs might account for a lack of moisture and fluffiness. I’m not sure of the brand since I bought it in bulk from Sprouts. I did use large eggs, also mixed everything with my blendtec. Perhaps I’ll try using another egg or egg white to see if that helps? Yes, I think another egg could help. Also, make sure when measure the coconut flour that you use the “scoop and swipe” method, where you scoop the measuring cup into the flour bag, then swipe the top clean with a knife. Even an extra teaspoon of coconut flour can make a big difference in a recipe, since it’s so absorbent! Hmm…wish I would have read farther down in the comments before putting mine in the oven. I thought the batter looked a little thick compared to the pictures up here. But, I see how this is most likely my error. I think I added a bit too much coconut flour. Next time I will be more careful! Still excited to eat them though! I also had the same issue and ended up adding some water to the batter because it was too thick. They tasted good but grainy as Favi mentioned. I also used my blender. I put the eggs in last and wonder if that made a difference in the way the batter whipped up? The eggs may also have been a little on the small side. I used Bob’s Red Mill flour and was thinking next time I should sift it first. I also lost my mojo where the frosting was concerned but think I know the issue – I had the can upside down in the fridge so it didn’t separate (at least that’s what I think the issue was…) So it was not a thick, frosting consistency. I poured it over a warm muffin anyway and it was very tasty nonetheless. Will try them again next weekend. I made these yesterday and they turned out well for me. I used a blender and needed to scrape the sides a few times to make sure it was mixed well. I baked them for 20 minutes in a mini-muffin pan. Also used Bob’s Red Mill brand. Only thing I’d change is I would grease the pan with coconut oil next time which I didn’t do. I thought there’d be enough fat to skip it, but you really need liners or greasing. I liked them very much and may try adding banana next time. I make grain-free cupcakes with my five year old daughter about once a week and she loves them! But I have never tried your awesome idea of adding zucchini to the ingredients. I’m looking forward to making your recipe this weekend! Do you think 1/2 cup applesauce could be subbed for the zucchini? It’s worth a shot! You might want to reduce the sweetener in that case. They look lovely! I love the addition of zucchini and no one will know!And coconut cream is my favorite! You can click on the link above to be taken to the recipe for the coconut whipped cream. Do you think I could use almond flour for these? Can’t wait to try! No, please see the substitution notes above. I’d recommend starting with one of my almond flour recipes if you want to make modifications. As I noted above in the Substitution Notes, there is NO substitute for coconut flour. Nut flours will definitely NOT work, without making significant changes to the recipe. I’d recommend starting off with one of my almond flour based recipes, instead, if you wish to make modifications. Because I can’t choose.. they all look amazing! These are my favorite: https://detoxinista.com/2012/06/raspberry-chocolate-chip-muffins-grain-free/ You can change or omit the add-ins to suit your tastes! I have an allergy to coconuts. I have successfully substituted 2 cups of gluten free oat flour for 1/2 cup coconut flour in other cupcake recipies. The end result is a bit denser than normal, but still very tasty. You do need to let the batter rest to make sure it won’t become too dry due to the oats. Looking forward to trying it with these cupcakes as well. These look great! Do you think I could substitute the maple syrup for pureed dates? If so, do you think it would be ok to decrease to 1/4c and not change the flour amount? I have no idea, since I haven’t tried it myself. Please let us know how it turns out for you! Yes, I’d just use slightly less agave since it’s sweeter than maple syrup. Could this be made as a cake instead of cupcakes? Looks sooo yummy! I really want to try this recipe! I have a grain sensitivity, and a minor nut allergy, so this is perfect! Oh I love coconut flour. I’m definitely going to try this recipe! I just have my questions with baking soda. I’ve been told it contains aluminium so usually I use a little bit of powder yeast instead. You can easily buy “aluminum-free” baking soda, if you prefer! Do you know how coconut flour combines? Does it combine as a starch or nuts? I would consider it to fall into the nut/seed category. So for someone who has nut allergies Coconut might be a safe fruit to eat because it is not a nut. I basically just try to put zucchini or another vegetable in anything I make. 😉 Hope your father enjoys this one, too! I am so glad I found you! I love reading your blog. You cook exactly like I do and I never have to change a thing in your recipes!! How would you suggest I reduce the sweetener? Just cut it in half and carry on, or do I need to reduce the dry ingredients accordingly? Your guess is as good as mine! I always learn by trial & error, so please let us know if you have any success with your experiment! I bet you could totally make these more muffin like – without all the maple syrup. I’m actually not a huge cupcake lover, but I do love muffins. I think my favorite flavor would have to be banana or blueberry. So good.